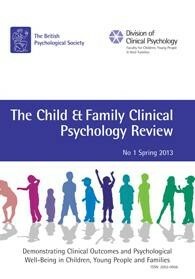 An article by Dan Hughes and another by five UK DDP Consultants have been published in Summer 2014 edition of the Child & Family Clinical Psychology Review (Division of Clinical Psychology Faculty for Children, Young People & their Families). Dan Hughes’s article looks at the principles effective interventions might rest on for children who have experienced developmental trauma and how the challenges to developing an evidence base might be met. Visit the website Resource Library for more information. The other article looks at how Dyadic Developmental Practice can provide a framework for therapeutic intervention and parenting. Visit the Resource Library for more information about this article.